I made a little change so bmp2bdf with respect characters' DWIDTH. 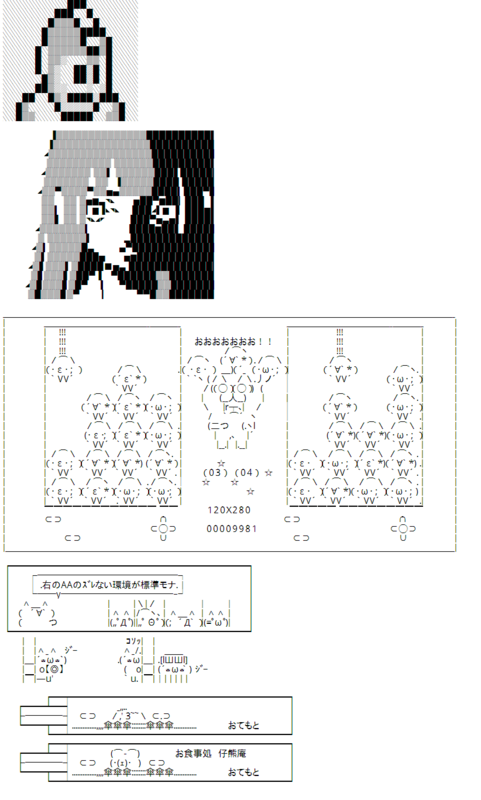 I modified some Japanese ASCII Art custom fonts from Free fonts. I made some minor changes to 16Edit 1.04 by Slangmgh, which is based on yoda's 16Edit module. I just found that there is still some use of old xdelta-1.x, but there is no latest 1.x branch win32 binary on the web! In 2003, Steve Nickolas wrote an IPS Patcher in C and compiled AmigaOS binary. I made some changes so it makes patches goes to new file but not writing to original file. Fixed "0x454F46 (EOF) offset bug"
In 2003, Stefan Koerner stripped vi from busybox-0.52 and called it virus - vi resembling utility skeleton. But it is unmaintained since then, so I do that again and called it "bbvi". Hopefully I will do it every busybox minor number changes, and sync bbvi version to busybox version. myc01's public domain touch utility is good, but I really hate the mandatory '--' switch, and not creating files (as a bug). So I hack it up and fixed these 2 issues. dwing's ujpg is good, but it is not open-sourced, and ujpg will strip out Adobe APP14 marker from JPEG YCCK image, which is vital to those files. So I wrote my own, modified from my own jpginfo. - add YCCK marker fixing switch "-y"
When I tried to debug why mozjpeg jpegtran segfault with certain files, I have a look on libjpeg and nanojpeg source code, and write a JPEG information tool which returns image resolution, number of color components, color space, and file type. Compiled with Py2Exe/Python 2.7 MinGW build with a modified setup.py. After reading Ka-Ping Yee ISO Latin-1 Font in linux kernel, I converted the font to BDF for use. - Add stub in iso_font.c so it writes font data binary array to binary file when runs. And there is other converted font in BDF or TrueType form in my Font Drop. Getting TTX 2.4 behdad-forked git rev snapshot compiled with Python 2.7.3(MinGW build) py2exe 0.6.9.